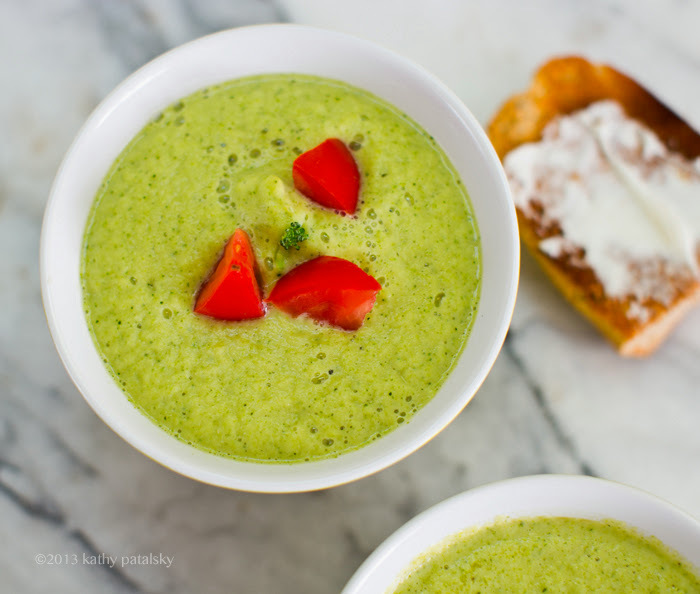 This easy soup is creamy and cheezy, thus why I call it my Easy Creazy Broccoli Soup! Use those veggies! I think everyone does this, yes?.. You load up on beautiful fresh vegetables at the grocery store or farmer's market only to find many of them sitting, achingly, in your fridge just begging to be used. A giant head of cauliflower, a big bunch of cabbage or maybe even a pile of stemmed carrots. Well it can be super easy to ease your veggie-buying guilt. Get in the kitchen and whip up a recipe using those beautiful veggies! 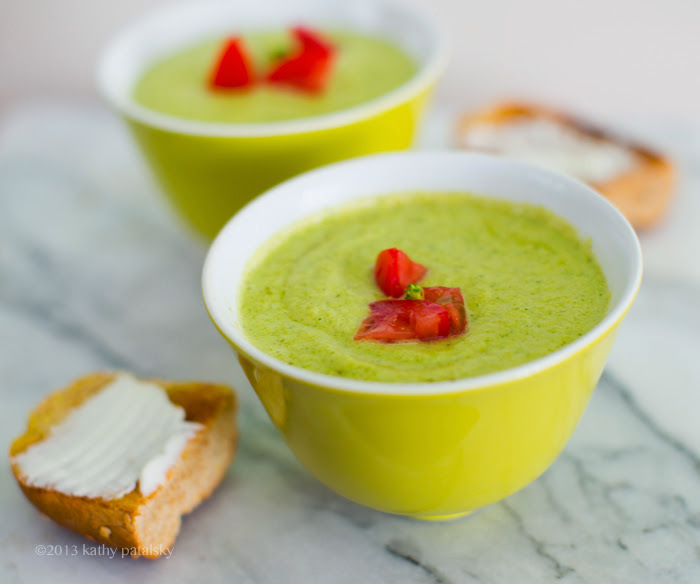 One of my fave, quickest ways to use a big pile of veggies for one amazing recipe: soup! This recipe is easy. No, I mean it. E-Z. But don't let the simple ingredients fool you. This soup was so creamy, rich, cheezy and delicious. 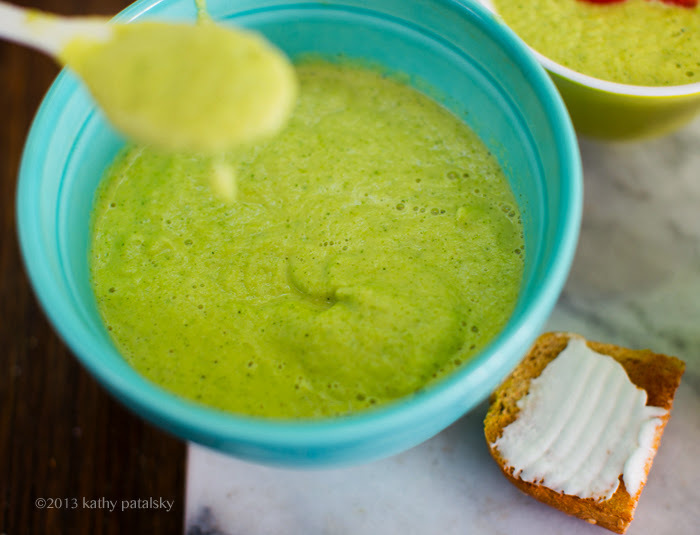 I will be buying cauliflower and broccoli again just to make this velvet-y spring green colored soup! ps. 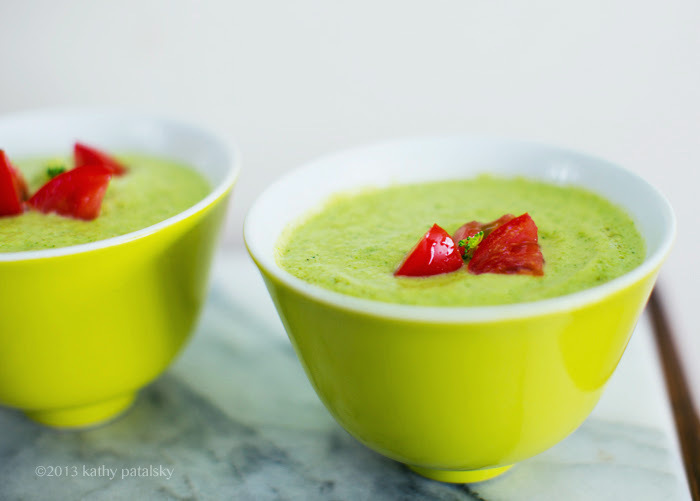 Serve with toasted bread slathered in vegan mayo / Vegenaise. 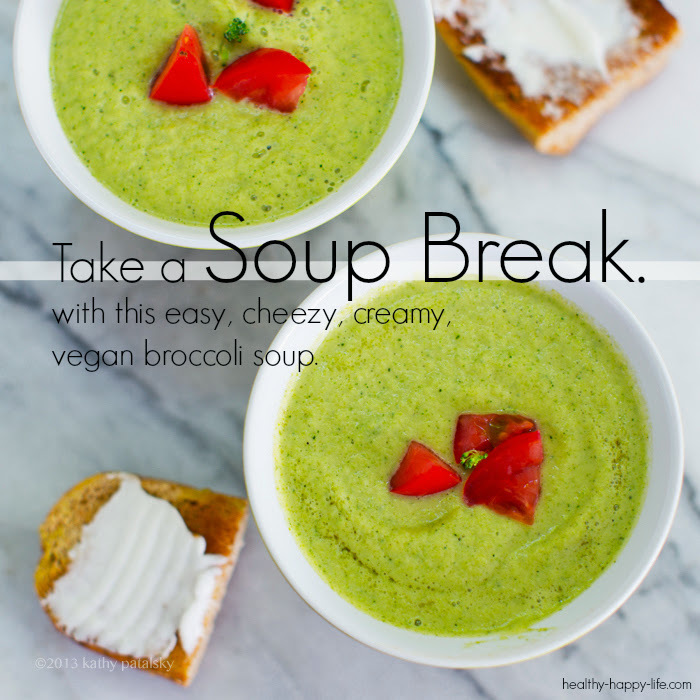 This adds the perfect touch to this "Soup Break" meal! Why Broccoli? This fun green veggie is a smart choice. Once serving contains 220% vitamin C, 18% vitamin A, 13% potassium (RDA's) and contains magnesium, iron, calcium and other vitamins and minerals. It is also rich in fiber. Fitday.com says, "Broccoli is part of a family of veggies known as cruciferous vegetables. These vegetables contain phytonutrients, which have anticancer properties .. studies show that diets high in cruciferous vegetables, like broccoli, are associated with a lower risk of breast, ovarian, lung, colon and bladder cancer." optional idea: add some avocado to the blend for added healthy fat! 1. Prep your broccoli and cauliflower by removing thick stems and breaking into large florets. Remove garlic cloves from skins. 2. Fill a large pot with salted water and bring to a boil over high heat. Add the broccoli, cauliflower and garlic. 3. Boil until the veggies are tender but not much. You should be able to slice with a butter knife with a slight amount of pressure. 4. Add the broccoli, cauliflower, garlic, almond milk, salt and nutritional yeast to a high speed blender like a Vitamix. 5. 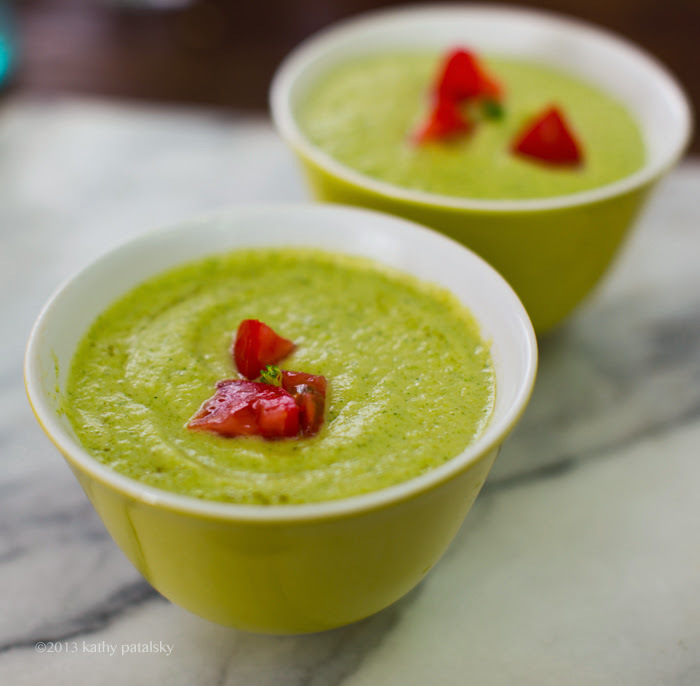 Blend on low until the veggies break down and the mixture smoothes. 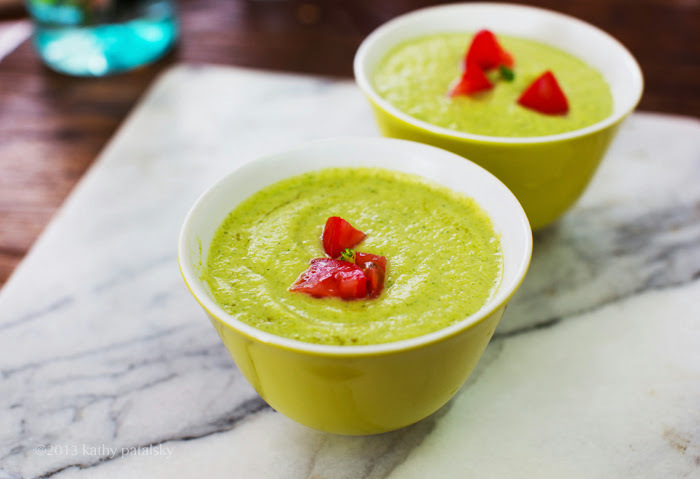 Blend on high for a few seconds to fully puree the soup into a velvety consistency. You can add more almond milk or even a few splashes of water if desired. Add more nutritional yeast and salt if desired. Other spices can be added as well. No oil is needed, but you could add a drizzle to the blend or over top to serve if you'd like. You could even blend in a 1/2 an avocado! 6. Serve right after blending - warm in temperature. Garnish of fresh tomato on top.